A vibrant and savory bowl of veggies that can be almost entirely made ahead -- perfect for meal prep! Meal prep means many things to many people… For us, it means trying to make sure the kitchen stays stocked with food we can quickly turn into breakfast, lunch, dinner or snacks. Each week it looks different depending on what needs to be restocked (Our favorite Almond Butter Chocolate Chip Engery Bites? Some kind of muffin? A sweet treat?) , how busy our weekend is and how busy the week ahead looks. This week, my husband is working from home, so I stocked the fridge with roasted veggies, quinoa and our favorite tahini sauce that we could turn into nourishing, hearty and tasty lunch bowls in minutes! This bowl is one of my favorite lunches from a few weeks ago: Roasted Carrots, Brussel Sprouts and Mushrooms, Garlicky and Lemony Zoodles, the yummiest Tahini Sauce plus 1/2 an avocado topped with hemp seeds. Fresh, nourishing and delicious! If you wanted, you could add any protein of choice to this bowl. Sometimes we’ll add chickpeas– roasted or not. Sometimes my husband will add grilled chicken or even some tunafish– really whatever we have already made or in the house. Since many of you often ask, sometimes I purchase zucchini noodles already spiralized. Other times I use a Paderno Spiralizer for the Zucchini Noodles (Amazon Affiliate link). The zoodles are much fresher if you spiralize them yourself. Scroll down for recipe and leave a comment if you try it. A vibrant and savory bowl of veggies that can be almost entirely made ahead and reheated! 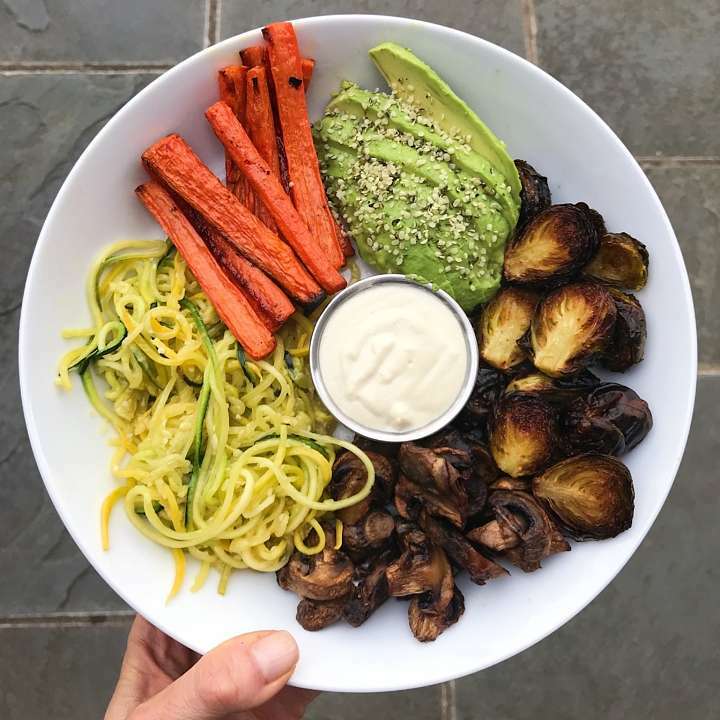 Warm garlicky and lemony zucchini noodles, roasted vegetables and the yummiest tahini sauce. Served with ½ an avocado and hemp seeds, it's gluten-free, nourishing, hearty and delicious! Feel free to add protein of choice or some chickpeas. Roasted veggies can be made ahead, stored in the refrigerator in sealed containers and served room temperature or heated up. I find the best way to heat up roasted veggies in in a skillet with a touch of olive oil. Alternatively you can heat them up in the oven. Tahini Sauce can be made ahead and stored in a sealed container in the refrigerator for several days. Zoodles: I find it best to spiralize the zucchini noodles ahead of time (if you haven't purchased them already spiralized), but to quick saute them in a skillet when ready to eat. The raw spiralized zoodles stay well in the refrigerator in a sealed container for several days. One type of vegetable at a time, either on the baking sheet or in a large bowl, toss the veggies in a small amount of oil (enough to coat but not so much that they are dripping in oil). Place in single layer on baking sheet. Sprinkle with salt to taste. Bake for 30 minutes, or until tender and crispy on the edges. Heat olive oil in a medium sauce pan over medium heat. When olive oil hot and shimmering (not smoking), add garlic* if using fresh garlic, stir for about 30 seconds until fragrant. Add zucchini noodles. Saute stirring frequently until Zucchini noodles are tender crisp, approximately 5 minutes. (Adjust cooking time if your noodles are thicker or thinner). *If using dried minced garlic, add to zoodles, once they are already cooking. Season with salt to taste and give a few squirts of fresh lemon juice. A little goes a long way so start with a few squirts and add more to taste. Place all ingredients in a small blender or food processor and process until smooth, You may have to stop and scape down the sides. Taste and adjust as desired. Add more water for a thinner sauce, more lemon juice for a brighter and tangier sauce. Do you have a preferred brand of tahini that you buy? I’d love the suggestion.